Want to know more about the species and habitats of the deeper parts of our oceans? Then this internship is for you! Prepare to be mesmerized with the beauty and intricacy of sponges (and their spicules). 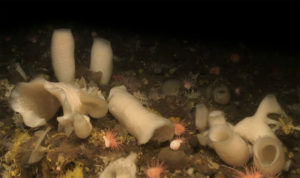 As part of the EU-funded project SponGES (see our website: www.deepseasponges.org) we are trying to understand the diversity and distribution patterns of deep-sea sponges of the North Atlantic, using a combination of traditional morphology-based taxonomy and advanced molecular methods. This is very important to support conservation of sponge-dominated habitats which are very vulnerable to anthropogenic activities, particularly those impacting the seabed (e.g. fisheries). We’re looking for one (or more) student(s) with an interest in deep-sea habitats and taxonomy. 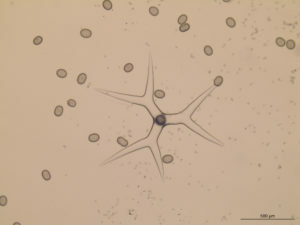 Your main tasks will entail the processing (preparation of slides) and analyzing (under the microscope) of sponge samples. There being the opportunity you may also be able to join a 1-day cruise onboard a research vessel to conduct sampling in the deeper-parts of the fjords around Bergen. The project involves: labwork, possibly cruise. Starting date/period: 13 Mars 2018 – 30 June 2018. You will develop skills on curatorial techniques of zoological collections and morphology-based taxonomy while learning about deep-sea species and habitats. You’ll be joining a vibrant research group and get a taste of what it is like to participate in a large European project. Involvement: 40h to be distributed according to the student’s availability.